All the recipes in Pidapipó are dictated by the seasons – giving you the freshest and most contemporary introduction to the sweet art of gelato! You'll find all of your favourite flavours, alongside new classics such as Banana Milk Gelato, Raspberry and Rose Bombe Alaska, Avocado and Lime Sorbetto, Blood Orange Granita with Dark Chocolate Sorbetto, Pumpkin Pie, Tiramisu Layer Cake and Brioche with Pistachio Gelato and Whipped Cream. 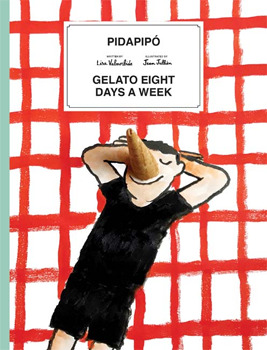 Pidapipó is fun, quirky and delicious – this is not your average ice-cream book! Discover 60 deliciously cool and creamy creations, including gelato, sorbetto, granitas, desserts and drinks, all exquisitely photographed and accompanied by illustrations from renowned French illustrator Jean Jullien. Lisa Valmorbida trained in traditional gelato making at the Carpigiani Gelato University in Bologna before opening her Melbourne gelateria, Pidapipó, in 2014. This bright and cheery destination now has people lining up for its authentic, indulgent gelato every day of the week, even in the middle of winter. Jean Jullien is a French graphic artist currently living in London. He comes from Nantes and did a graphic design degree in Quimper before moving to London. He graduated from Central Saint Martins in 2008 and from the Royal College of Art in 2010. He works closely with the musician The Coward. His practice ranges from illustration to photography, video, costumes, installations, books, posters and clothing to create a coherent yet eclectic body of work.